JKR adhesion theory starts with measurements of little rubber balls being pressed into contact with a flat surface. To understand the effects of adhesion we first have to see what happens when there's no adhesion, which is the Hertz case. As a bonus, the Hertz contact formula is widely used for all sorts of real-world contacts of rubber with surfaces. Just slide the Force slider to see what happens to the contact width. 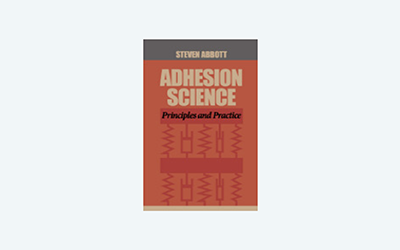 At the heart of understanding adhesion is an experiment that has been done countless times by adhesion scientists. It's not at first obvious what this has to do with adhesion - but read on, it's both simple and important. A sphere of polymer of known modulus E (which gets modified in the formula to E* via the Poisson ratio which is ideally 0.5) and known radius R is pressed with known force against a flat surface. Via clever optical means (these days people use lasers) the contact diameter, a, is measured as the force F is gradually increased. This Hertzian squashing of the rubber is familiar to those who use rubber laminating rollers on coating machines; the larger the pressure (for a given roller diameter and modulus (Shore hardness) the greater the "footprint" of the rubber. Not surprisingly, when there is no pressure there is no squashing of the rubber, i.e. a=0 when F=0. This "fact" is built in to the Hertzian formula. Although it is obvious, and although for big rubber rollers the footprint at zero pressure is taken to be zero, in fact the Hertzian formula is wrong! At zero pressure the rubber naturally deforms to produce a finite contact width, a. That's because the surface energy forces are sufficient to pull the two surfaces together.